See a map of the current operation plan. A long-running campaign to save the forest in Southern Alberta is facing the same kind of arrogant treatment that we do. 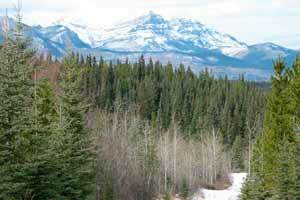 The Allison/Chinook forest in the Crowsnest Pass is about to fall to the Spray Lakes Sawmills feller-bunchers. 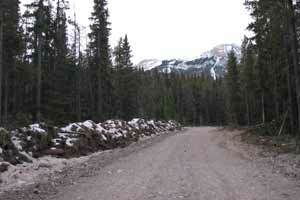 Photos show areas flagged for logging along the Lusk Creek and Baldy Pass trails and another area along Hwy. 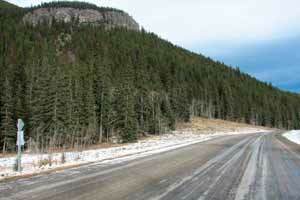 68 near Barrier Lake in the Sibbald district. 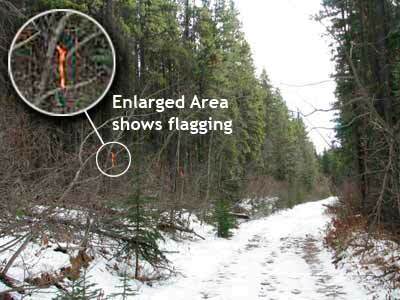 Flagging tape visible on the east side of Old Baldy trail and Lusk Pass trail just south of Hwy 68 near the Stoney Creek Day Use Area. The photos above show a before and after view of the Lusk Creek trail. The image on the left was taken in November, 2007; the photo on the right was taken at another point on the same trail in January, 2008. 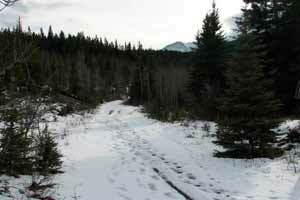 This trail is part of the Trans Canada Trail which heads east towards West Bragg Creek and west towards Heart Creek. Cutting began in mid-November. Come spring the forest on the left (east) will be gone. See updated photos. 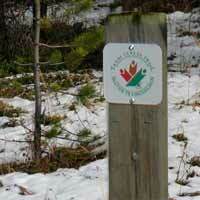 The second area flagged for logging in November, 2007 is along the north side of Hwy 68 about 2.5 km east of Stoney Creek.